Todays Salvage Search was less about searching and more about it finding me. This is becoming more often the case, as local businesses and fellow makers start to think about the waste they create and what they should do with it. 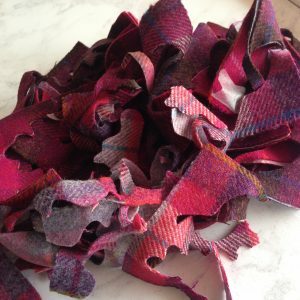 The wonderful Anne of Fab Fleur has sent me a massive bag of her Harris Tweed offcuts. Of no further use to her, these beautiful scraps of fabric would have tragically found their way into landfill. I can’t wait to get creating with these wonderfully rich sumptuous deep pinks and purples… hmm Valentines maybe?